I was observing classes today, and as always, I left inspired. One of the best parts of being an instructional coach is the ability to go to several schools and observe multiple classrooms. Each time I visit a school, I walk away with strategies and ideas that I am impelled to share and use. Today I noticed a bulletin board in the back of a classroom. The board functioned as an exit slip board. Five general questions about the class experience were posted on the board. Students were to take a note card, answer the question, and slip the note card in the appropriate slot. The picture illustrates a similar way to use an exit slip, but evaluation is added as students would place the exit slip where they would rate themselves on specific knowledge. 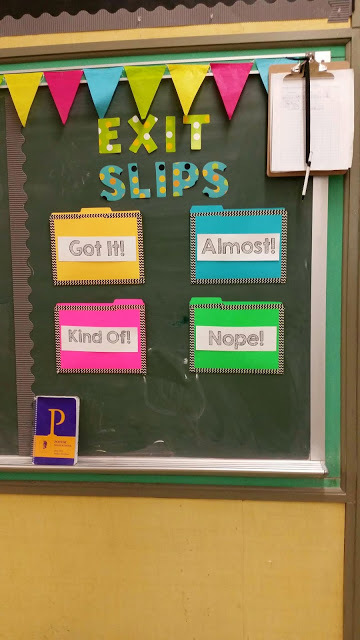 When used at the end of a classroom, students could simply get out of their seats and turn in the exit slip. If important information was needed to be delivered to the entire class, teachers could have students return to their seats in order to tell students what they need to tell them. This provides a simple shift in the classroom, allowing students to transition physically and mentally to the information they need to hear. This can be adopted at any moment in the class. Exit tickets are generally used at the end of class period, but they can also be used at a moment of transition. By adding simple movement, students are able to adjust and prepare for new content or a new activity. Plus, it is an easy way to add movement to block classes and to middle school and high school classes.